HALLIE EPHRON: Another thing I'm picky about is food. The reason my husband doesn't cook is that for the last 40-plus years I've kept him out of the kitchen. I like to eat my own cooking. Fortunately he's a brilliant, not-picky eater -- a world-class appreciator of other people's cooking. Some of my favorite dinners seem to spring from nowhere -- pulled together from whatever's in the fridge. Usually I have the ingredients for some version of peanut noodles, riffing on a recipe that in Epicurious for Sweet and Spicy Peanut Noodles. 1. Sautée or boil the chicken or shrimp until just done. (If you have leftover chicken just take a few hunks and shred them.) Set aside. 2. Cook the pasta according to package direction. (If you do this in advance, add some oil to the water so the pasta doesn't congeal into a mass while it's cooling, and reserve some of the pasta water.) Drain. 3. While the pasta is cooking, sautée the garlic and ginger for a few minutes in a small saucepan. Add all the ingredients for the sauce and cook for about 4 minutes until it's thickened. Add some pasta water if it seems too thick. 4. Throw it all together - noodles, sauce, most of the veggies (hold aside cilantro and scallions). MIX. 5. 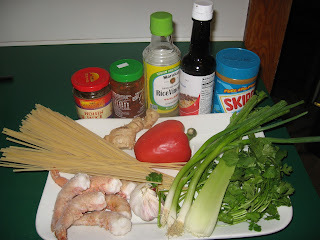 Top with the shrimp or chicken or peanuts and cilantro and scallions. What are your favorite what's-in-the-fridge meal? Yummy. That's one of mine, too! I like to make it with soba noodles so there's a little more chew to it. I also make a whats-in-the-fridge quiche with a leftover brown-rice crust and various vegetables and herbs in it. But not in full summer - too hot to bake. Depending on the season, we enjoy both quiche and soup. 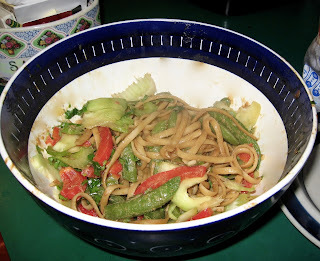 There’s always vegetables to add to either; sometimes we make a simple stir fry. We’ve done quiche with cheese, with vegetables, with chicken, and with salmon . . . . I like doing frittatas with leftovers. Everyone is impressed and it's really easy and economical. Plus, then you get to say the lovely word, "frittata." Yum, printed that recipe. Mine is a version of Aglio Et Olio that I adapted from Cooking Light. I love most anything with anchovies, and the whole thing comes together in the time it takes to boil the pasta. I've made a simpler version of this salad many times, but your version is so much better! I've never added protein beyond the peanut butter. What have I been thinking? This could happen at our house this very weekend. Thanks! I'm not sure my kids would eat this, but my husband and I would! For summer we try to stock salad makings (at least until the garden comes in). Salad with some sort of protein (usually chicken or steak because both can be grilled) is a summer staple for us. But we'd have to skip the shrimp - The Boy has become allergic (sad, because he adores shrimp). YUM! I love to take whatever there is, and add something else, and use it as a pasta topping. For instance, the other night, I saw we had leftover grilled salmon, so I sauteed that quickly with with lemon olive oil and garlic and black pepper and (yes, frozen but thawed) green peas. Grated Parmesan on top--and hurray. Yum. And then I said frittata, because agreed, Susan. Frittata! We have good friends with free-ranging chickens that are almost TOO productive, so in the summer we always have these lovely, golden-yoked eggs. Hallie, since we have a CSA, each week (starting now!) we get a big box of greens, herbs and veggies. Your peanut noodles sounds like the perfect way to use up some of the bounty. Hallie, I often do a version of "fried rice" that's very similar. We have a rice cooker, so often have leftover cooked brown rice. Leftover rotisserie chicken comes in handy for this, too. Saute lots of garlic and ginger along with whatever other veggies come to hand, remove to plate. Add a couple (or more) beaten eggs to a bit of peanut oil in the pan. Let the eggs spread out and cook very gently until just firm enough to be sliced into little squares with the spatula. Add a little more peanut oil and the leftover cooked rice, stir until rice is hot and egg is mixed in, then add the sauteed veggies and chopped chicken (or any cooked meat or fish). Add some soy/ginger sauce, some soy sauce, some toasted sesame oil, and a dash of sweet hot chili sauce. Yum. We also do the frittata! Usually with leftover whole what spaghetti. Tomorrow night using up broccoli, spaghetti, with eggs and cheese. When the frittata is almost set, I grate parmesan on the top and put it under the broiler for a couple of minutes. Going to try the peanut noodles with soba! Usually my default for a quick, use-what-I-have meal is stir-fry. I have one basic sauce recipe that is my go-to, but 6 months or so ago I came across a post where someone had compiled about a dozen different sauce recipes. 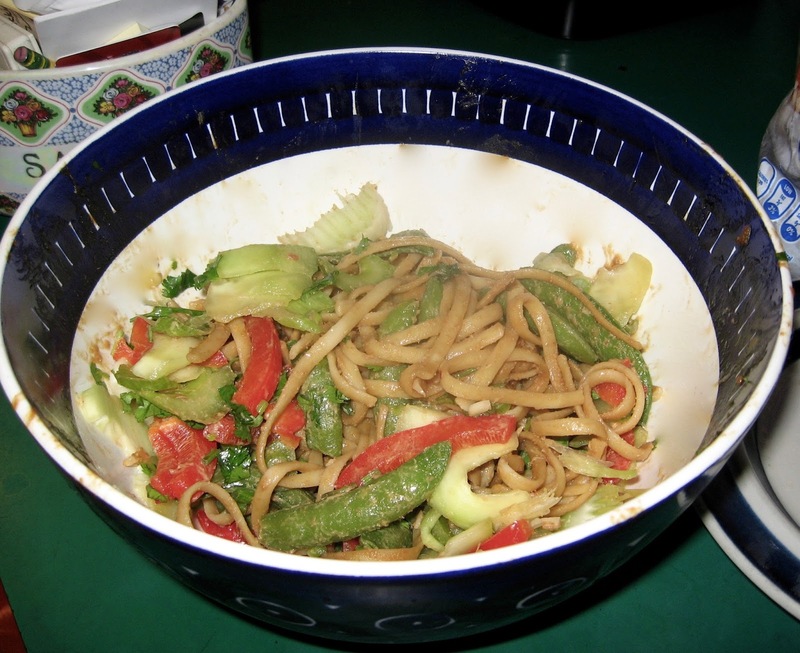 The author was obviously someone after my own heart -- almost any mix of vegetables and protein makes a good stir fry. The different sauces mean you can default to stir-fry even more often without it becoming redundant. We most often eat stir-fry over brown rice, but I have been known to serve it over white rice, quinoa, couscous or pasta. My regular one features ginger root, sesame oil, soy sauce and pepper as main flavor-giving ingredients. Among the ones in the list are versions based on peanut-butter, orange juice, lemon-pepper, teriyaki, and more I can't recall at the moment. In the winter, I'm also the queen of soups. Leftover rice and leftover vegetables suggests a quasi- fried rice.Throw them in a frying pan with a little dark sesame oil and some soy sauce. Maybe add a little garlic or ginger. Beat an egg and stir it in. When the egg is cooked, you have a meal. Even easier than it sounds. Mmm, yes to noodle and peanut sauce. I've made a version for many years, a NY Times recipe from before peanut sauce could be bought in any supermarket. Leftover chicken is certainly great and so is leftover steak, sliced thin. Tofu would be good too. True confession? I have often sopped up all the extra sauce with a handy piece of bread. Too delicious to waste. Of course as the summer produce comes in, gazpacho is the perfect answer to too many tomatoes plus too many cucumbers/celery/peppers. I make it with spicy V-8 juice for extra zip.